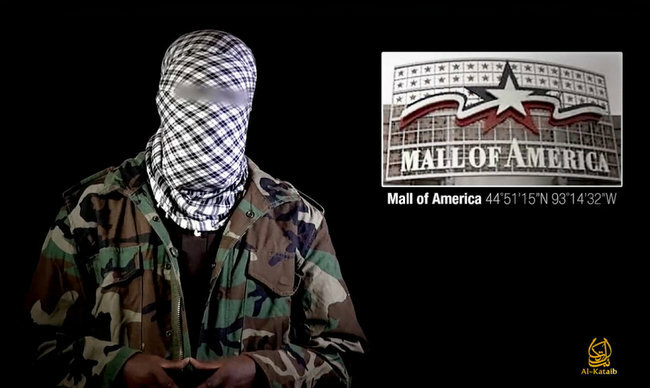 BLOOMINGTON, Minn. — Officials with the Mall of America are taking extra security precautions after a video released by an Islamist terror group considered to be an affiliate of al Qaeda released a video calling for attacks on malls in the Western world. Al-Shabaab released the video online on Saturday, citing three specific malls in the footage: the Oxford Street shopping strip in London, England, the West Edmonton Mall in Alberta, Canada and the Mall of America in Bloomington, Minnesota. The African group, believed to be behind the 2013 terror attack on the Westgate Mall in Nairobi, Kenya, begins the video with images of the assault. The hour-long production later shows a masked African man in a camouflage jacket calling for similar attacks in the west. The footage included an image of the mall, as well as the coordinates for its location. As a result, the Mall of America has stepped up security as a precaution. The Department of Homeland Security and FBI also issued a statement advising that they are aware of the video and are analyzing the footage. “In recent months, the FBI and DHS have worked closely with our state and local public safety counterparts and members of the private sector, to include mall owners and operators, to prevent and mitigate these types of threats,” it reads. Homeland Security Secretary Jeh Johnson appeared on CNN this morning to state that shoppers should exercise extra caution and keep an eye out for anything suspicious. Al-Shabaab, being translated, means “The Youth.” It states that its goal is to wage war against the “enemies of Islam” and is recognized by the United States and several other countries as a terrorist organization. The group is believed to have been formed in 2006 and is affiliated with al Qaeda and the Islamic Courts Union.